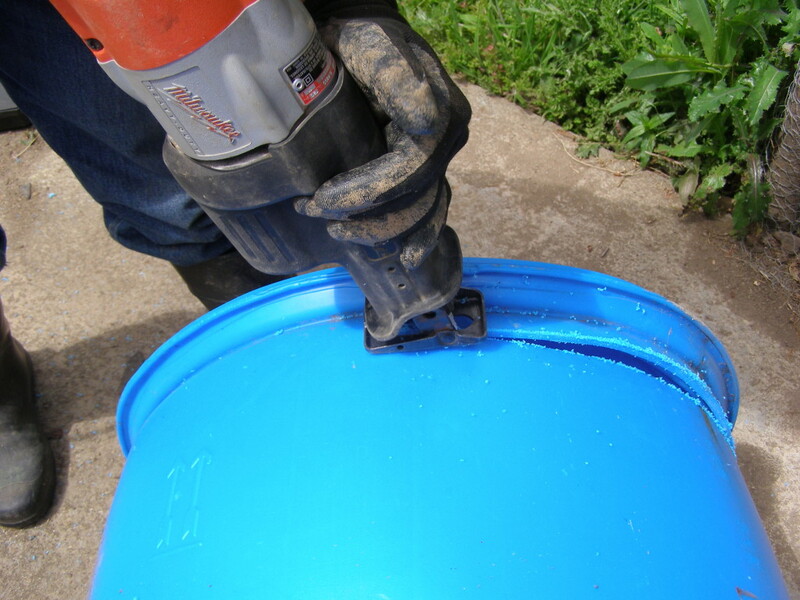 The plastic up near the top of our 55 gallon drum is thick – too thick to cut through with small power tools. So we made our incision an inch below the seam connecting the vertical wall from the horizontal surface. 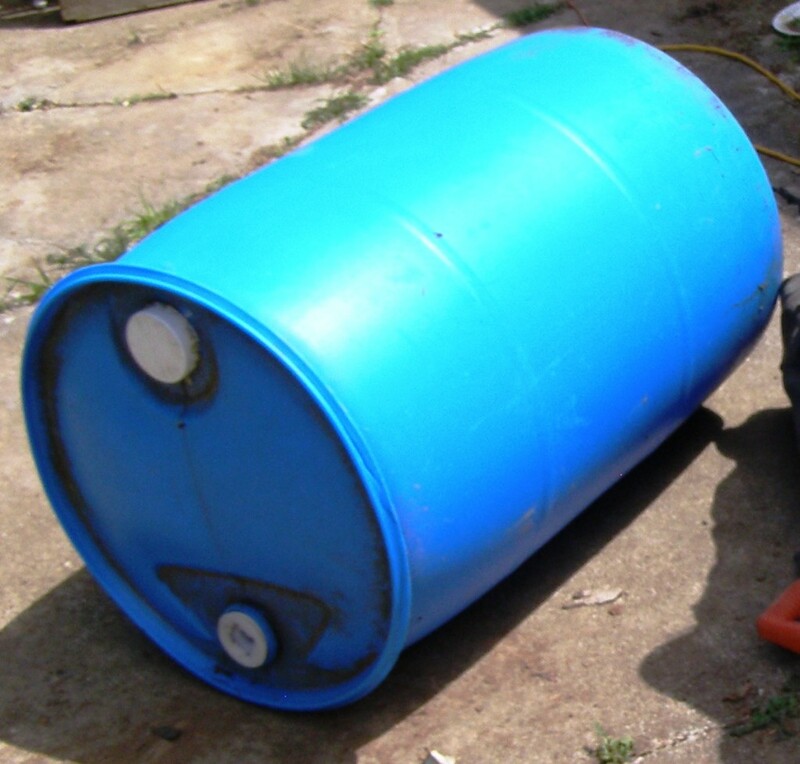 We could have cut off the bottom instead which is made of thinner plastic, but then we would have a spout at the base of the drum, which would be hard to keep sealed. 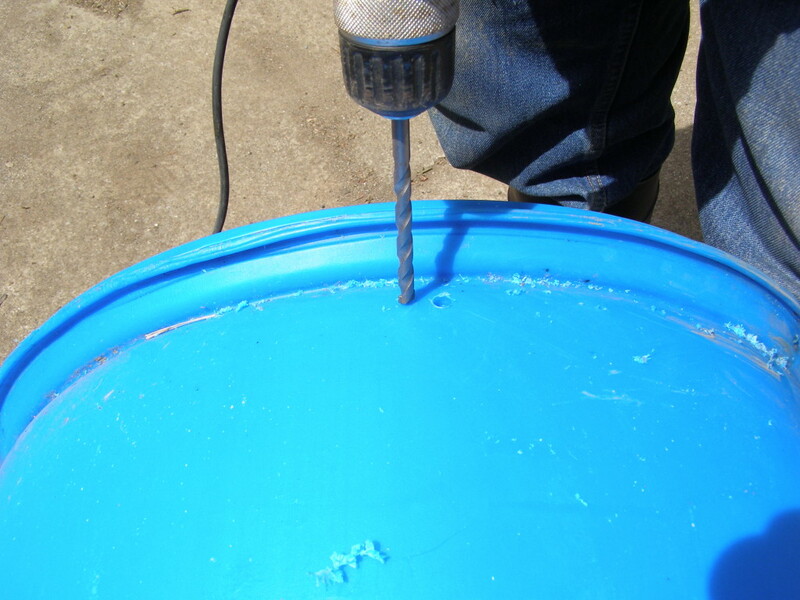 We used a Milwaukee Sawzall to make the incision around the edge of 55 gallon drum. We weren’t sure it would work, but it cut through the bucket wall like butter. But before we could use the Sawzall, we had to bore a hole through the wall of the 55 gallon drum. This was the hardest part of the hole operation. You need a hole big enough to fit the Sawzall blade into – about 3/4″ wide. A Sawzall is great at cutting one direction but cannot drill into what you’re trying to saw whatsoever. It just slams into the surface like a woodpecker, making a huge racket but hardly a dent. So we had to drill. Since we only had a 1/4″ drill bit, we drilled two 1/4″ holes right beside each other then used a jigsaw to connect the holes. The resulting gap was big enough to get the Sawzall blade into. It would have worked better to use a much larger drill bit or hole saw bit and skipped the jigsaw altogether, but we had to work with what we had. We needed two people for this job, one to hold the drum in place and one to make the incision. We rested the drum on its side and had one person sit on top, straddling it. 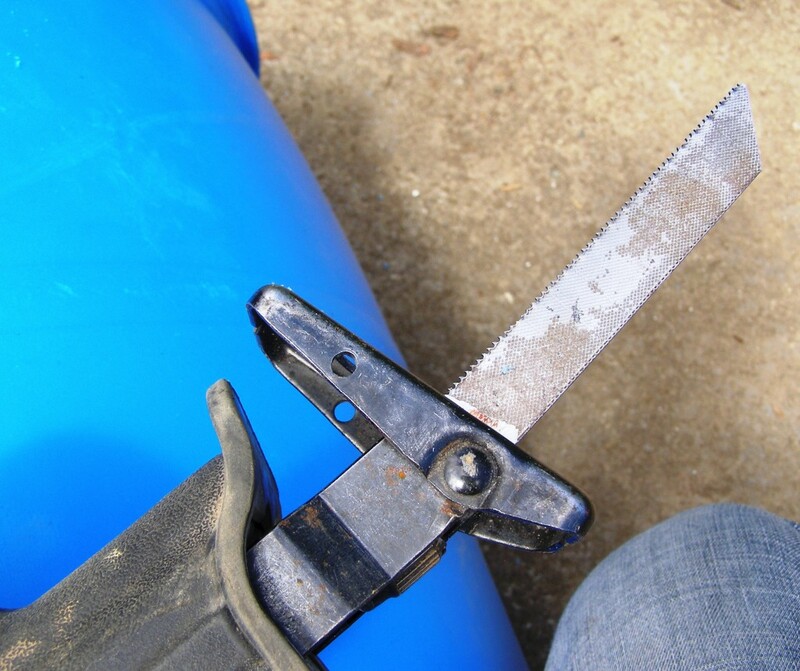 The other person used the Sawzall to slice evenly around the barrel – a cut that took less than a minute all the way around. We filled the barrel right away with nettles and water. After it’s done and we’ve used it on the plants I’ll put up another Five Gallon Idea describing the nettle tea process and how the plants responded. 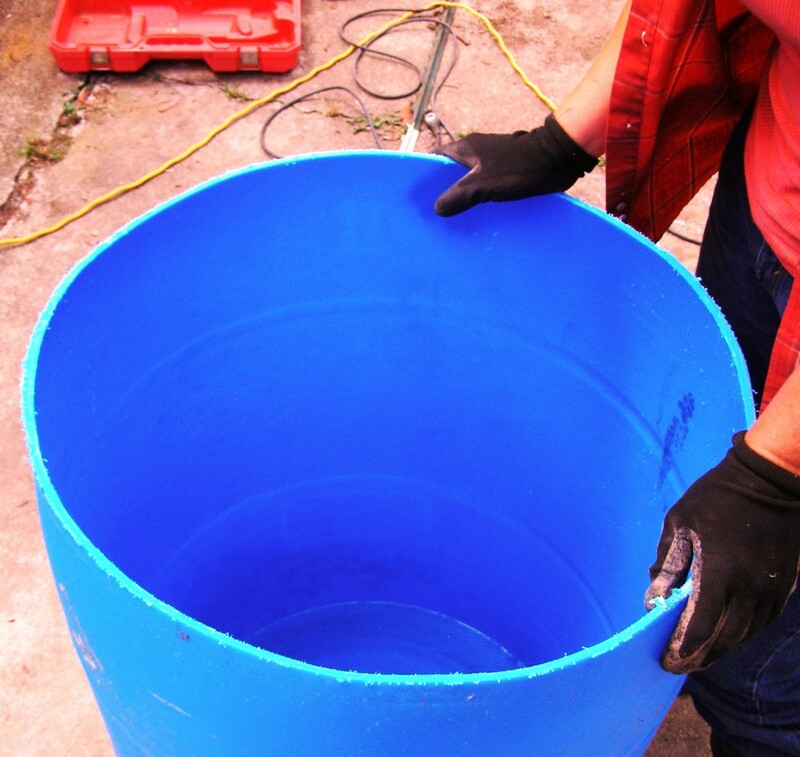 And that’s how we made our biggest bucket ever. If you aren’t already familiar with the Sawzall reciprocating saw, you can learn more about it on Amazon. You can use the sawzall with no pre-existing hole, you just need to approach the surface to be cut with the blade held horizontally (teeth down, of course), instead of vertically. As the bottom of the blade touches the barrel/surface, the blade will jump around a little at first, but if you apply a little bit of pressure, it will find a groove and cut right in, and once you’re through, you can change your angle to vertical and get to cutting that line. Yep. I’ve done the same thing on various materials. And either that jigsaw OR the sawzall would have cut through the top easily, with a proper blade. I also drill two holes about an inch from the top and loop some rope thru for a drag handle. On one that I use for compostable items I put handles on both sides so I can hook the tractor bucket tines to the bucket to lift it. Inverted, the lid fits almost perfectly to keep out critters and rain. The upside down lid taper matches the barrel taper almost perfectly.